This week has been so busy! My wedding is in October and most of the plans have been arranged this very week, as the new fiance has been on vacation. I, however, have been making the rounds as I received an announcement that Coffy's was closing, only a few days after my opening! (oh no!) 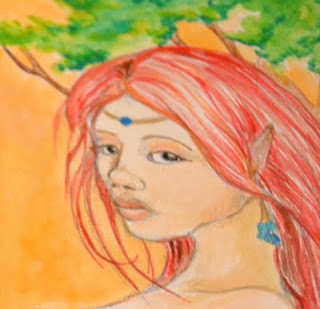 No worries, though, as I was able to get my paintings (except for the sold art of course!) out of the venue safe and sound before the new owners came in to take over as the buy/sell/trade place it is to become (hopefully a boon to the Plaza economy which is full of wonderful creative spaces). Available work as always is on my website and you can follow postings here and on Facebook. For any artists who ever read my blog, the lesson here is always make sure you have something in writing when you hand your work over to someone, because in today's unpredictable times, you never know what could happen tomorrow! 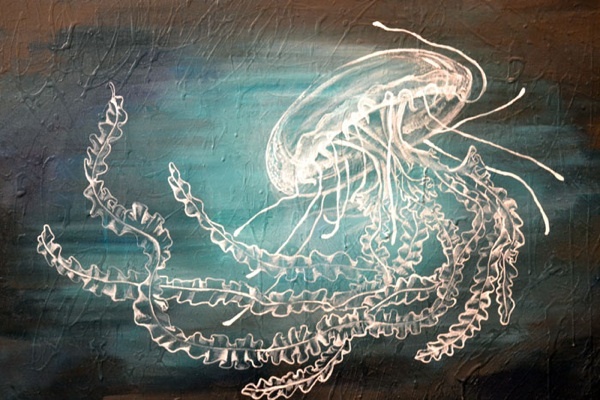 Now on the upside to this (and never knowing what could happen)... one of my larger works, Dans la Mer, the jellyfish, is being displayed (and for sale) at Cafe Nova OKC... They are located nestled in the Western Avenue shops area of OKC, serving contemporary american cuisine and offer a unique nightclub experience and host events and private parties...and have recently been displaying contemporary art on their walls. I am honored to have a piece in the venue with other OVAC artists like Bryan Boone and Juuri. Want to see the piece? Here is my image of it. It is 24x36" and would look lovely in an interior with teal/turquoise accents. It is heavily textured and all acrylics. Next little tidbit... I am offered ACEOs- "Art Cards Editions and Originals" (essentially larger nicer versions of Artist Trading Cards) via my Etsy shop... I have had such fun making smaller pieces and I have sketchbooks and notebooks FULL of ideas...so this seemed like a great way to do some affordable mini-arts that would be wallet-friendly (and they are about 3.5"x5" with a clean edge, so there are lots of framing/grouping options if you want to put them on a wall or in an album). Below is a detail from the "dryad ACEO" I have for sale. One has already sold but watch the shop for more added soon!